In recent bulletins, St. Mary’s and Sacred Heart parishes in Albany listed good news and bad news. 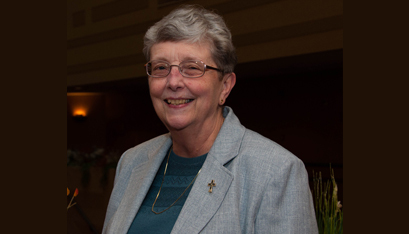 The good news was that parish outreach/social ministry coordinator Sister Peg Sullivan, RSM, had been elected to the leadership team of her religious order, the Sisters of Mercy of the Northeast. The bad news was that, since the position is full-time and based in Cumberland, R.I., she’d be moving there soon. “We agree with her community’s choice of an excellent leader! We are delighted and excited for her future, even as we have to say goodbye to such a talented and capable member of our parish staffs,” the bulletin notice said. For Sister Peg, moving is bittersweet. Speaking with The Evangelist on her last day at Sacred Heart, she said it had been particularly hard to tell one Syrian family she’s gotten to know. The family has seven daughters, ranging in age from 18 months to 12 years, and Sister Peg could only explain the news to the mother with the children translating for her. That was a change for the Mercy sister, who started religious life as a science and math teacher. Sister Peg holds a bachelor’s degree in chemistry education from The College of Saint Rose in Albany, a master’s in natural sciences from Rensselaer Polytechnic Institute in Troy and a master’s in church managment from the Graduate Theological Foundation in Indiana. One of Sister Peg’s other hats was working at Pyramid Lake Camp, a diocesan summer camp in Paradox for children that later became Pyramid Life Center, offering retreats and workshops that draw people from across the country. Sister Peg ran a nature program for kids, which evolved into working for Catholic Charities. She learned about grant writing — a natural fit, she says, for someone with a scientific mind — and stuck with the agency for 20 years, becoming executive director of the Maternity and Early Childhood Foundation and then a member of Catholic Charities’ administrative team. Her next “hat” was working in finance and administration for St. Henry’s parish in Averill Park and the diocesan office of the Society for the Propagation of the Faith. After about a decade, she was approached about the outreach/social ministry positions at St. Mary’s and Sacred Heart in Albany, since both parishes’ coordinators were ready to retire. “This job isn’t what I went looking for,” Sister Peg told The Evangelist. But “I really have appreciated” all of the people who volunteer and who come to St. Mary’s outreach ministry seeking food, clothing, bus passes and toiletries. Sister Peg has handled everything at Sacred Heart from working in the food pantry to serving free lunches for people in need at the parish’s Friendship Table. When she pondered the new role she’s about to take on — she’ll be vice president of the Sisters of Mercy Northeast community — Sister Peg noted that she’d been asked to take on leadership positions before, but always turned them down. “This time around, I said I was willing,” she explained. The sisters elected her at an assembly in late April, saying her analytical bent and her gifts as an organizer would serve the religious order well. “The nicest thing for me is when people say I have a love of mercy,” Sister Peg remarked. This is a time of transition for many religious orders, including the Sisters of Mercy. Eventually, said Sister Peg, the order may move toward having one consolidated leadership team. One thing she knows is that all the sisters need to work together to ensure a bright future for their community. Sister Peg believes in being as open as possible to sharing about prospective decisions and developments with her fellow sisters. Dear Peg...Blessings on ye as you go into the unknown of your new position. I am sure that you will be a true daughter of Mother Catherine...I have held you and many dear sisters close to my heart and in prayer always...You were always a model of Mercy...an inspiration to This comment has been hidden due to low approval.